Ratan-sutta is the first chapter consisting 18 pali gathas in Chulavagga of Sutta-nipat under the Khuddaka-nikaya. It repeats a line: idam pi sanghe ratanam panitam etena sachchena suvatthi hotthu. Buddhghosh, (5th century A.D.) the commentator of Sutta-nipat gives a mythological account while commenting the rattan-sutta about the origin and nomenclature of Vaishali, lichchavi and vajji. This sutta-nipat-atthkatha mentions the significance role of King Ashoka in spreading the Buddhism. In this sutta the distance between Rajgir and Ganga is mentioned five yojanas and that between Ganga and Vaishali is mentioned as three yojanas. Thus this is a historically and mythological important sutta. Once upon a time Vaishali was followed by severe draught and diseases. People of Vaishali went Rajgriha and requested Buddha to come to Vaishali to liquidate them. Lord came to Vashali and preached the origin of Lichchavis, seven jewels of the king and the Shankha episode. This preaching called Ratan-sutta. Once upon a time the queen of Benaras gave birth to an embryo as red as the flower of Bandhujiva. Wishing to avoid disgrace, she put it in a sealed casket and through it in the Ganga River. One diety took pity on it and rescued it. The casket has the seal of the king, so knowing the fact he pasted a golden inscribed leaf on the casket mentioning that this bears the embryo of the queen of Benaras. At this time an ascetic lived near the hamlet of a milkman near Ganga River. In the morning he shows the casket floating on the water. He took hold of it and read the inscribed leaf. He took it to his hermitage and kept it. After three fortnights the embryo divided and became a boy and a beautiful girl. The hermitage began to take care of them. But they have not the skin of their body. So whatever went into their stomachs they were clearly visible. Hence they were called nichchhavi (Sanskrit- nirgatã Chhavih yasya i.e those who has not his shape) by some. Others called them lìnachchhavi (Sanskrit- Lìnã chhavih yasya i.e. those who has inseparable shape). They thought the covering of the stomach and the food particles inside it were inseparably woven together. Hence these two children were called Lichchhavis. One day when the milkman came to know that the ascetic had to go out everyday to feed two children at a secrete place, they came to him and requested him to allow him to take care of these children. The ascetic gladly accepted and instructed him to take care with great honor. He further said that they should be allowed to marry each other when they grew up. He also asked him to produce for them a plot of land from the king, develop there a town and make the boy king of this newly made township. When these children grew up with other children of the milkman and went to know about there birth story they said that they were not to fit to be kept company of, instead they were to fit to be expelled. (Sanskrit- prabrajitavyah, Pali- Pavvajitabba, ii.e. to be expelled) Since then the place where they lived was called Vajji. When the township was developed there, the boy married his sister and on being anointed a king, he made it a rule that no any girl of his kingdom should be allowed to marry outside and no girl from outside should be allowed to be brought as bride. Later on a twin consisting of a boy and a girl was born to them. Sixteen such twins also born subsequently and they were married. Now they needed more space and thus the original plot of land expended. Hence it was called Vesãlì. There are seven Jewels on earth: the wheel (chakra- a vehicle), the elephant (hatthi), the horse (assa), the gem (mani), the women, (Itthi), the treasure ( gahapati) and the valuable adviser (parinayaka). All these are jewels which a world king is supposed to be possessed. They are called Ratan by virtue of the fact that they are very rarely available and they give immense pleasure to the possessor. But they are earthen and none of these deserves to be compared with the three jewels viz. the Buddha, the Dhamma and the Sangha. It is further described here that there are two kinds of jewels: one is endowed with consciousness and the other is devoid of it. The first is superior to the latter and can be divided into two categories of man and animal. The first is being superior can be divided into two male and female. Both of them a male is more capable of spiritual development than a female. At last the Buddha is far superior to pachcheka Buddha (pratyeka Buddha) and therefore the Buddha is the most invaluable of all jewels and so are the Dhamma and the Sangha. The commentator Buddhaghosh describes a story of Shankha under Shankha Jataka which is not found in Jatakas. The Bodhisattva was once born as a Brahmana of Takkashila as Shankha. He got a son named Sushima. He sent his son to Banarasa to do study of Vedas. He studied there the beginning and the middle of Vedas but did not found the last. 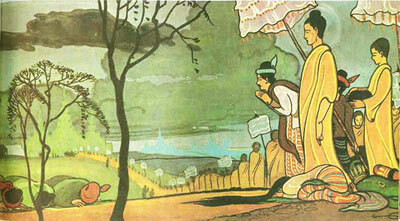 Then his teacher commanded him to go to Rishipattana (Present Saranath) where pratyeka Buddhas were dwelt upon. There he joined the order and very soon attained pratyeka Bodhi and died there. Having heard no news of his son Shankha came Baranasi and got this news. He went to the pyre of his son and cleaned the grass, sprinkled sand , watered it and scattered wild flowers. He also put up a flag of his robe there. Buddha said to Lichchhavis that in this birth, because he had cleaned the pyre his journey of eight yojans from Rajgir to Vaishali was made comfortable and as he had spread sand over the pyre .s o his route was made level. As he had scattered flower, so his route was also scattered with flowers. As he had sprinkled water so there was a fountain in the Vaishali and as he had raised a flag and put up a parasol on it the whole gays of Vaishali have a flag and a parasol. Thus Buddha teaches that no good action of a man ever goes abandoned and therefore they go long way in inspiring to do noble actions. The commentary of Buddhaghosh on this Ratan-sutta also describes the way to Vaishali from Rajgir. It refers that when King Bimbisara went to know the journey of Lord to Vaishali he made rest-houses between Rajgriha and Vaishali each on a distance of one yojan. If this legend has any base, those houses can be explored now. King Bimbisara also made boat, decorated with jewels and flowers with a diamond throne to cross the river Ganga. When Buddha climbed on the boat the King Bimbisara waited on the bank of Ganga for the returning of Buddha for long time. When the King of Vaishali knows the arrival of Buddha to Vaishali, he also made three rest-houses each on one yojana. Thus we find the distance of these cities traditionally mentioned. Sutta-nipata or, Dialogues and Discourse of Gautam Buddha Translated from Pali by Sir M. Coomara Swamy, 1874. PART II. CHULA VAGGA. 1. RATANA SUTTA. Sabbeva bhūtā sumanā bhavantu Athopi sakkacca suṇantu bhāsitaṃ. (If there be) any spirits assembled here belonging to the earth or living in the sky, let all (such) spirits be of a good mind; let them, moreover, attentively listen to what is said. Divā ca ratto ca haranti ye baliṃ Tasmā hi ne rakkhatha appamattā. Therefore, O spirits! do ye all hear me. Exercise friendliness towards the human race, who bring (to you) offerings both day and night; without (being) slothful, therefore, protect them indeed. (If there be) any wealth whatever, either here or in the world of Nagas, or any excellent jewel in the heavens, there is none equal to Tathagata. And this Snakes lit. ; but the word means also a species of human being with the hoods of snakes, to Buddha. Excellent jewel (is found) in Buddha, May there be happiness from this truth! If the sage of the Sakya race, of a tranquil mind, has attained any state of extinction (which is) passionless, immortal, and excellent, there is nothing equal to that Law. And this excellent jewel (is found) in the Law. May there be happiness from this truth! If the Supreme Buddha has extolled pure meditation; if (he and others) have spoken of any unceasing meditation, there is nothing equal to that meditation. And this excellent jewel (is found) in the Law. May there be happiness from this truth! Idampi saṅghe ratanaṃ paṇītaṃ Etena saccena suvatthi hotu. If there be one hundred and eight priests praised (by the saints), they are the four pairs. They are the disciples of Buddha, worthy of offerings. Things given to them become very fruitful. And this excellent jewel (is found) in the Association (of priests). May there be happiness from this truth! Whoever with a firm mind, freed from desires, are well established in the religion of Gotama, (are even) those who, arriving at Nibbana, enjoying tranquillity, have attained, without (paying any) price for it, the state which should be attained. And this excellent jewel (is found) in the Association. May there be happiness from this truth! As a door-post fixed in the earth is not moved by the four winds, so, I declare, a good man is he who having learnt noble truths, discerns them clearly. And this excellent jewel (is found) in the Association. May there be happiness from this truth! They who understand the noble truths preached well by him who is possessed of profound wisdom, though they be greatly distracted, shall not (have to) take the eight births. And this excellent jewel (is found) in the Association. May there be happiness from this truth! On (attaining) the bliss of knowing (the holy paths ) these three things are abandoned (by a man) —vanity, doubt, (and) the practice of useless ceremonies. If there be any (such), he is also released from the four hells, and (rendered) incapable of committing heinous sins. And this excellent jewel (is found) in the Association. . May there be happiness from this truth! It has been declared that if a (man) commits a sinful act in any manner, either by (his) body, word, or thought, he ought not to conceal it, (and) that he who (in the state of Sotapanna) has seen Nibbana, ought not (also) to conceal it. And this excellent jewel (is found) in the Association. May there be happiness from this truth! Idampi buddhe ratanaṃ paṇītaṃ Etena saccena suvatthi hotu. The eminent and the incomparable one, acquainted with what is eminent, giving what is eminent, bringing what is eminent, preached the eminent Law. And this excellent jewel (is found) in Buddha. May there be happiness from this truth! The old (Kamma being) extinct, the new (Kamma) not produced, the wise — their hearts freed from a clinging to future births, their seeds of existence destroyed, their desires not springing up again — are extinguished like a lamp. And this excellent jewel (is found) in the Association. May there be happiness from this truth! Whatever spirits are assembled here, either (belonging to) the earth or living in the sky, let us worship (said Indra) Buddha, the Tathagata reverenced by gods and men ! May there be happiness! Tathāgataṃ devamanussapūjitaṃ Buddhaṃ namassāma suvatthi hotu. Oh, whatever spirits are assembled here, either (belonging to) the earth or living in the sky! let us worship the Law, the Tathagata reverenced by gods and men ! May there be happiness! Tathāgataṃ devamanussapūjitaṃ Dhammaṃ namassāma suvatthi hotu. Tathāgataṃ devamanussapūjitaṃ Saṅghaṃ namassāma suvatthi hotu. Oh, whatever spirits are assembled here, either (belonging to) the earth or living in the sky! let us worship the Association, the Tathagata reverenced by gods and men ! May there be happiness!